Granted, it’s a bit of a stretch when comparing the state of the art mechanically reliable 2018 Mazda MX-5 Miata Club to the British roadsters of the past. Yet, when the then near micro sized Miata roadster came on the scene back in 1989, the Lotus Elan look alike went for the jugular of less mechanically reliable British RagTops of the day. The affordable and fun to drive Miata was an instant success. Arguably, other than the Fiat 124 Miata (see 2019 changes for Fiat 124) knock off, there isn’t much out there to compare to MX-5. Our Miata Club variant sits mid trim in the offering, yet presents a very comprehensive convenience and active safety package, including near intuitive touch screen, and rotary dial controls, a decent sounding stereo system, comfortable Recaro seats, and genuine Brembo brake calipers and rotors. Our Mazda expert John Goreham comments on the future of Miata. Underpinning Miata Club is arguably the best riding and handling suspension in Miata history, with ample power transferred to the rear axle via a close-throw 6-speed manual transmission and a very good fuel injected, naturally aspirated twin cam 4-cylinder engine. Claiming a tire spinning 158 horsepower and 148 lb-ft torque, Miata Club is impressive for a roadster that weighs in at just a tad over 2300 lbs. Visually, the 5th generation of the best selling 2-place roadster in history is captivatingly thought provoking. For many reasons, Mazda Miata remains unique unto itself. Yes, there are several convertible compact cars available that give Miata a run for the money when we look no further than the price tag. But that’s where this contest ends, with the exception (perhaps) of the Mazda platformed Fiat 124 Sport Spyder. Truthfully, there’s little practicality to be found in Mazda’s segment topping roadster from a conventional mode of personal transportation viewpoint. 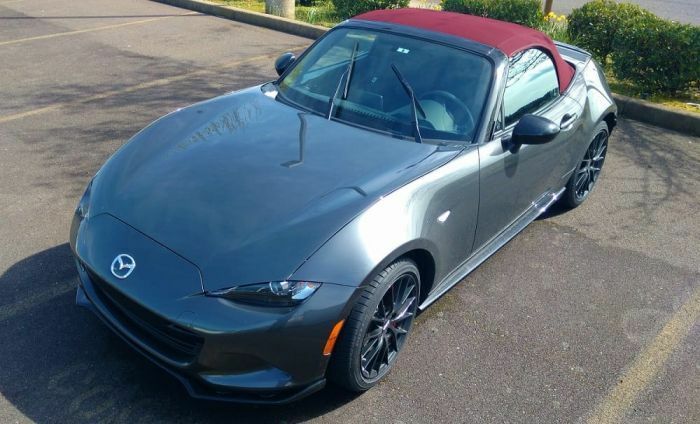 So for me, a life-time motorcycle rider, I compare Miata Club to a well equipped touring motorcycle, with the added advantage of a relatively large trunk, weather tight drop-top, very comfortable seats, fantastic climate control, and a touch screen and dial controlled stereo, and convenience settings. Need a bit more room in your compact Mazda? Also see: Americans Never Got These Rad Miata Specials, but When You See Them, You'll Want One. Hey, Miata is very cool, and turns heads everywhere one drives it. It’s quick, agile, fuel efficient on torque-happy. Priced from $25,295, I recommend a MIata test drive to anyone considering the purchase of a compact roadster, or heavy weight touring motorcycle. You’ll find excuses to drive Miata, it’s contagious. What I like: Responsive rev-happy engine, descent handling and ride dynamic, exceptional maneuverability and drop dead good looks. What I’d change: It’s time to update Mazda’s dash top touchpad and monitor. Hey, how about a back-up Cam Mazda? And, let’s build a variant that accommodates taller drivers without compromise. Other than that, perfect! This is my 3rd Mazda Miata drive review in as many years. The more I drive it, the more I contemplate purchasing one as a daily commuter. It’s hard to find fault with a car design that’s held up well for decades. Miata is the best selling compact roadster of all times because it’s honest. With Miata, what you see, is what you get, a great compact open top roadster at an attainable price point. Don't Miss: A 14-Year-Old Mazda Miata May Be Better Than a New One. Photo Attributes Parks McCants 2018.